Linguist's Software has been approved to sell the magnificent Bibliorum Sacrorum Graecorum Codex Vaticanus B color facsimile. Codex Vaticanus is the oldest surviving manuscript of virtually the entire Bible in Greek. It was written about A.D. 350 and is regarded as the most important manuscript of the Greek Bible. 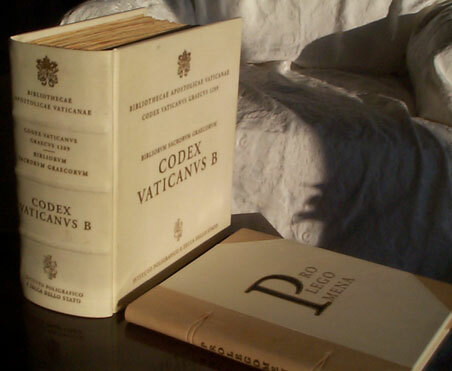 This is the first time that the entire Codex Vaticanus has been printed in color. The price at the latest exchange rate is USD $5470 (includes express shipping and insurance). Title: Bibliorum Sacrorum Graecorum Codex Vaticanus B. Format: One 30 cm tall volume parchment-bound facsimile with gold impressions on cover and spine, 1536 pages. 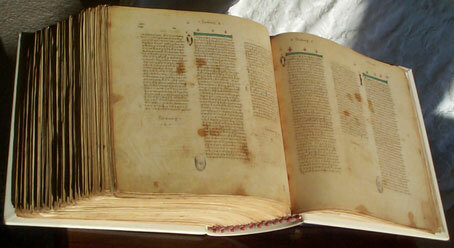 One parchment- and leather-bound Prolegomena volume with gold and silver impressions, 74 pages. General Notes: At head of title: *Bibliothecae *apostolicae *Vaticanae Codex Vaticanus *Graecus *1209. Very fine facsimile reproduction of the original Greek manuscript. Bound in parchment with gold impressions on cover and spine, issued in a Plexiglas case, which case is provided for protection in transit only and is not guaranteed to arrive without defect. Prolegomena volume of commentary essays in English or French. Includes bibliographical references and notes. 450 numbered copies printed for sale. Historical Significance: The Codex Vaticanus B (Vat. Gr. 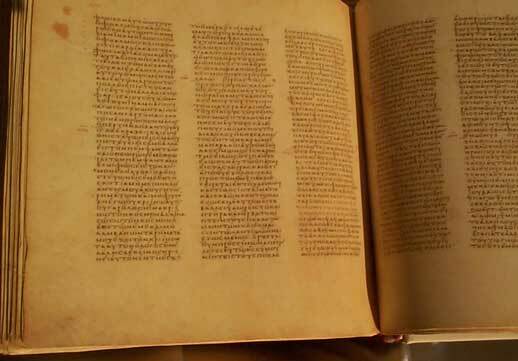 1209, written in the fourth century) is considered to be the oldest extant copy of the Bible, and is, along with the Codex Sinaiticus, one of the two main witnesses supporting modern Greek texts and English translations. It contains in Greek most of the Old Testament with the Apocrypha (excluding 1 and 2 Maccabees and the Prayer of Manasses) and most of the New Testament. Codex B is believed to have reached the West during or after the Council of Florence (1438-1445), as a gift from the Byzantine Emperor Ioannes (John) VIII to Pope Eugenio IV. It appears in the Vatican Library's earliest catalog of 1475 with shelf number 1209. 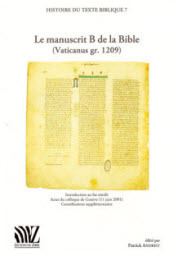 This beautifully executed facsimile faithfully reproduces the 1560 pages of the original manuscript conserved at the Biblioteca Apostolica Vaticana and is enriched by a further volume of Prolegomena essays by Paul Canart (in French), Pierre-Maurice Bogaert (in French) and Stephen Pisano (in English). "Italian craftsmanship is alive and well. Everything about this instant rare work spells deluxe. It came in a wooden crate weighing 16 kilograms. The two volumes and thick clear-plastic case alone are quite heavy. The thick full-color individual paper pages of the codex are shaped like the original with rough edges and no blank margins. Even blank pages, cut-off leaves and holes in the parchment are mimicked in this edition. The entire codex is reproduced in one beautifully-bound volume, including the Old and New Testaments. The only modern addition to the codex volume is a two-page authenticity certificate with the serial number in the form: 021/450. The book works very well mechanically: there is no need to fight to hold the pages open to read any text. The resolution of the facsimile under a magnifying glass appears to be excellent. The Prolegomena volume includes the imprimatur by Joannes Paulus II, a subtle watermark portrait of the Holy Father, three essays, a column-by-column index of the codex by verse numbers, and a certification page with serial number. The index is very helpful, because the pages of the codex volume are not adorned with any modern notation. The untranslated essays in the Prolegomena volume are: NOTICE PALEOGRAPHIQUE ET CODICOLOGIQUE by Paul Canart, LE TEXT DE L'ANCIEN TESTAMENT by Pierre-Maurice Bogaert, O.S.B., and THE TEXT OF THE NEW TESTAMENT by Stephen Pisano SJ ." The graphic below shows a portion from Galatians 1 (page 1488B). It demonstrates the fidelity of the color and the sharpness of the image so you can clearly distinguish between the apricot-colored ink of the original hand and the chocolate-colored reinforced text. 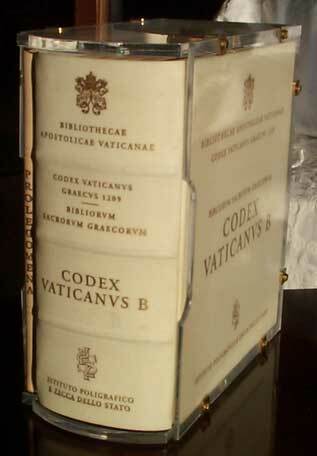 This magnificent facsimile of Codex Vaticanus is available only until the portion of this limited edition that is open to the public is sold out. For information please email . 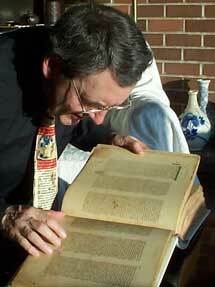 Philip B. Payne, pictured above, the founder and president of Linguist's Software, Inc., has written extensively on Codex Vaticanus. Philip B. Payne and Paul Canart. "Distigmai Matching the Original Ink of Codex Vaticanus: Do they Mark the Location of Textual Variants?" pages 199-226 in Patrick Andrist, ed., Le manuscrit B de la Bible (Vaticanus graecus 1209): Introduction au fac-similé, Actes du Colloque de Genève (11 juin 2001), Contributions supplémentaires. Lausanne, Switzerland: Éditions du Zèbre, 2009. See Le manuscrit B de la Bible for more information. Philip B. Payne. 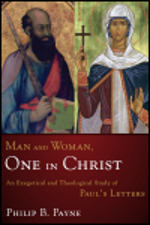 Man and Woman, One in Christ: An Exegetical and Theological Study of Paul's Letters. Grand Rapids, Mich.: Zondervan, 2009, 511 pages. 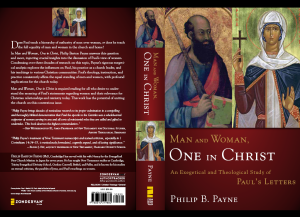 This book is a careful exegetical examination of Paul’s teachings regarding women and their standing and ministries in the church and home. It is the condensation of 35 years of research on this topic and is full of insights that shed new light on a host of issues and correct many misconceptions. This work rigorously analyzes both the text of Paul’s statements and the meaning of the text through penetrating exegetical study. It affirms the complete reliability of all of Paul’s teaching. 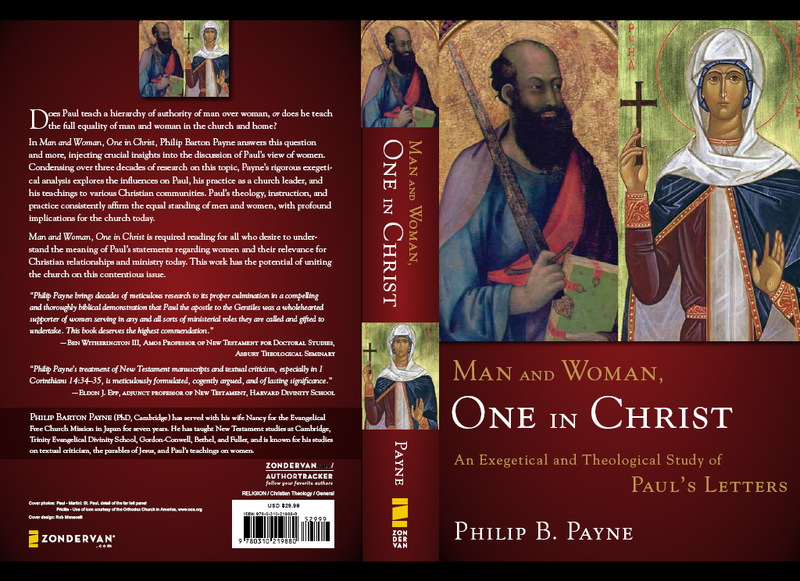 The work begins with an examination of the influences on Paul, then it explores Paul’s many statements about women who were his colleagues in ministry and Paul’s theological principles that undergird his affirmations of the equal standing of man and women in Christ. In light of Paul’s practice, it examines each of Paul’s statements regarding the standing of women and their ministry in the church.